Refer to photos 4-6. CLICK ON THE THUMBNAIL FOR AN ENLARGEMENT. 4. Thought the Sculpey form was somewhat soft it did a decent job of supporting the putty.I ran hot water over the piece after it had cured in order for the putty to separate itself from the Sculpey form. 5. I had to turn the piece and slide it out sideways to remove it. There are some rough edges and excess material to clean up, but overall it came out okay. At this stage I'm not too worried about detail. That step will come after I permanently attach the piece to the lower body.The photos show both the inside and outside of the coat. 6. 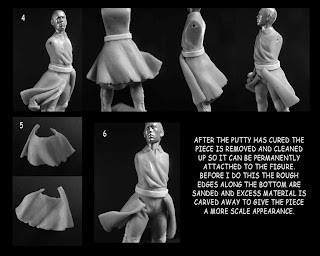 Here is the lower coat placed back on the figure following removal of the Sculpey form.